It’s that time of the year again where love is given utmost importance and is being celebrated with great gusto the world over. Love is in the air and it’s a day where we get to see roses, hearts, cupids and every symbol that is connected with love. Isn’t it amazing to know that ‘Love’ is just a four letter word, but the whole world revolves around it? Everyone waits when cupid would strike and shower love into their own lives. Everyone craves to be loved and to love in return. And I’m not speaking solely of romantic love. It could be the love between a mother and her child, affection between friends and so on. Even animals crave for love. It has a different meaning to different people. To many it’s an art of giving without expecting anything in return. It’s a final stage of bliss and happiness. Most songs, poems, books and movies are created on love, only because it’s a phenomenon beyond our understanding and comprehension. With all the love stories floating around us, with many relationships ending in a mess, with many couples ending up with broken hearts, many still take risks and dabble themselves in this strange phenomenon. It’s a mystery to me and to many of you I’m sure. Many prominent scholars and writers have contributed their own definitions and interpretations of love. There would be kids who would certainly question their parents today about Valentine’s Day and the reason behind its celebration. As parents we can help put Valentine’s Day into perspective for them. By simply telling them that the day is dedicated to love between family and friends is good for a start. We can share the legend that goes behind celebrating Valentine’s Day. The legend goes that ‘Valentine’ was a priest who served during the third century in Rome. At that period, Emperor Claudius decided that single men made better soldiers than married men. He prohibited marriage for young men. Valentine could not bear to see the injustice. He defied Claudius and continued to perform marriages of young couples secretly. When his actions were discovered, he was put to death. A couple can have the most romantic and cherished moments on this special day. But when kids come on the scene, change is inevitable. Most Parents would love to make them a part of the celebration too. Involve them in decorating the house with decorations like hearts, streamers and balloons. 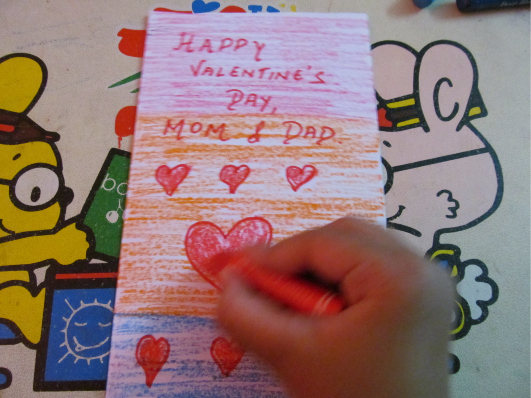 Our kids can be encouraged to make greeting cards and small gift articles that can be easily made at home and present them to their parents and siblings as a gesture of love. This would encourage family bonding. It would also tap their creative skills. Valentine’s Day is all about warmth. So why not make this day special for the less privileged? By purchasing some food items, goodies or clothes for the underprivileged is also a day well spent. This way kids can be taught about charity and love for humanity. Cook something special that they would enjoy and relish. Something that would gladden their taste buds. Kids, who are adult enough to see why the festival is celebrated, can be put across the true meaning of love which is about kindness, respect, honesty and giving. It’s not about harassing, degrading, and being possessive or revengeful. So when they grow up they may know how to share the true meaning of love with themselves and with others too. I’m so looking forward to celebrating a wonderful day with my Valentine – my husband. So here’s wishing all the couples a Happy Valentine’s day and those who are still waiting for their soul mates, I wish you loads of luck. Happy Valentine’s Day to one and all. Uhh…Where is the pause button?